We took a field trip today to Cavanaugh Flight Museum in Addison for their special Homeschool Day. In addition to the awesome planes that we usually see, they had some special activities for the kids to enjoy. We studied this plane last year in school as we learned about the Red Baron. I wish I had thought to come see it in person at the time we were studying it but it was cool to see it today. There was a scavenger hunt for the kids to find answers to questions. There were prizes for winners so Nicholas worked hard on it and read the plane information looking for the answers. We found this military version of a Piper Cub which I believe is the kind of plane my Dad flew at one time. We learned about the USS Hornet aircraft carrier that headed to Japan during WWII. Rachel loved the small scale model that included planes and little bitty people. We all got excited to see the model of the children's learning center that will be coming to the museum in the near future. Rachel loved the control tower with the tube slide coming down the side of it. While Nicholas worked on his scavenger hunt, Rachel pretended to do the same as she drew on the scavenger hunt questions and map. I liked this cool Air Force plane and tried to get Rachel to pose in front of it for the picture. She just crinkled up her face and whined "no". What a stinker! Rachel was fascinated with the pilot mannequin. There was a panel of pilots who talked to the kids about how they got interested in flying and a little about their jobs. One was airline pilot, one was a private instructor, and the other was a corporate pilot. They answered questions from the kids after they talked. Nicholas liked the Sherman tank. 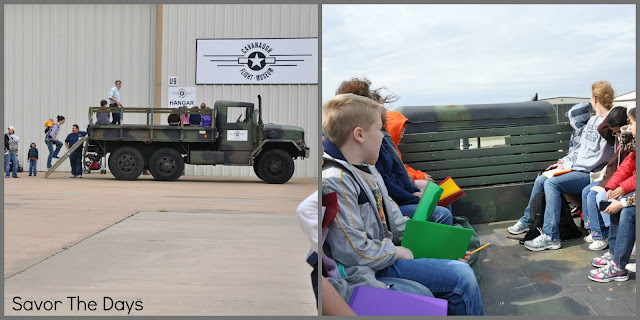 We got to climb onboard a "deuce 1/2" military vehicle and go for a ride around the airport. On the ride we saw the control tower. The kids had fun looking at all the cool planes that we drove past. We hopped on a shuttle to check out another hangar. I think the kids enjoyed the shuttle ride as much as they did seeing the planes. Rachel wasn't as impressed with the bombs. She preferred to use the open space near the door to fly around like an airplane. I loved seeing one or more American flags in each hangar that we visited. Rachel enjoyed "taking care" of the smallest friend that was with us. She kept her arm around him as he walked "to catch him if he fell down". Everyone seemed to enjoy playing with this demonstration of how a prop spins. One of the mechanics talked to us a little about this plane engine and let the kids take some parts off an on. They had a wrench attached to the display and certain pieces were removable while others were apparently welded on to keep kids from totally dismantling the engine. Great idea. Even Rachel really enjoyed this. I think I'd like to set up a little activity for her that has a board with holes, some nuts and bolts, and a few wrenches so she can practice. She enjoys it but it is also good exercises for muscle development in her hands as well as hand-eye coordination. This was an experimental shot looking at Nicholas through a piece on the top of the engine. Nicholas and Granddad have matching Flying Tigers P-40 Warhawk t-shirts from an earlier visit to Cavanaugh several years ago. Nicholas made sure to wear his shirt today and got excited when he found the actual plane in one of the hangars! I enjoyed watching Nicholas laugh and run around with his friends. I personally loved finding the Sopwith Camel replica which was the plane used to shoot down the Red Baron in WWII. Nicholas found this cute model of a Pan Am airliner that shows cut outs into the cockpit and cabin areas. We also stopped at the paper airplane table. There were instructions and supplies for making several different styles of planes. Nicholas made some of them but then made a few of his own design. There was a board with two holes in it for kids to throw their paper airplanes through to score points. Rachel and her friend posed in the holes for this pic. How cute! We had a great time visiting the Cavanaugh Flight Museum for Homeschool Day. 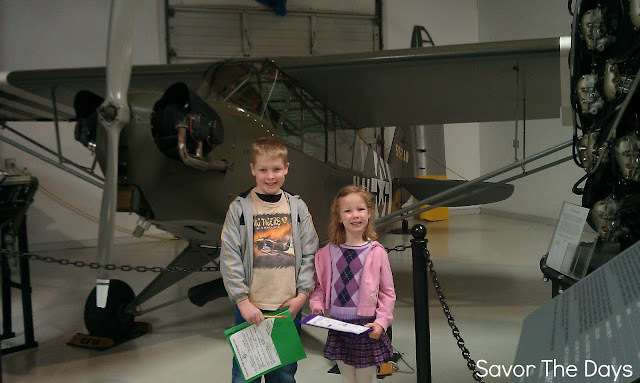 Both of my kids enjoyed looking at the historic planes as well as participating in the special school activities. The Cavanaugh Flight Museum is located at 4572 Claire Chennault in Addison, Tx. They are open Mon - Sat 9:00 - 5:00 and Sun 11:00 - 5:00. Prices: adults $10, seniors/military $7, children 4 and up $5.00, children 3 and under free. For more information, please call 972-380-8800 or visit the Cavanaugh Flight Museum website.